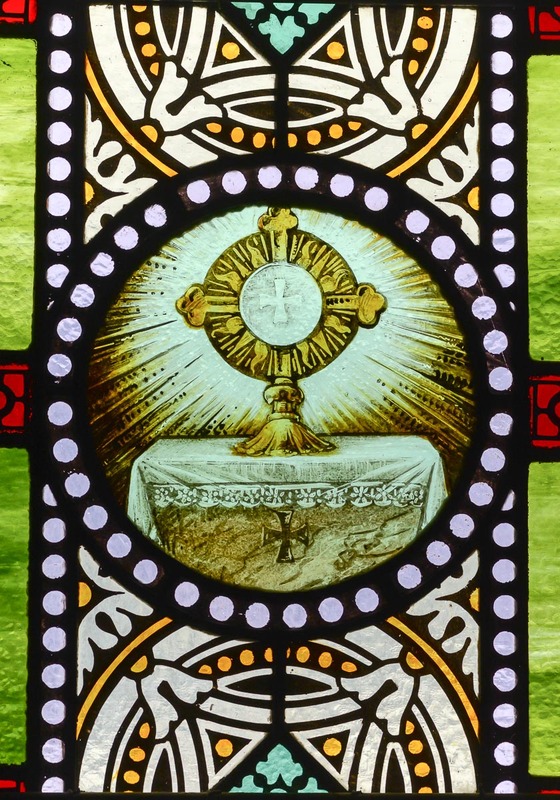 Jesus instituted the sacrament of the Holy Eucharist at the Last Supper when he blessed the bread and wine, saying “this is my body’ and “this is my blood,” distributing them to his apostles to eat and drink (Matthew 26:26-28), and commanding them to “do this in remembrance of me” (Luke 22:19). Earlier, Jesus had shocked many of his followers by insisting that “Truly, truly, I say to you, unless you eat the flesh of the Son of man and drink his blood, you have no life in you” and “my flesh is food indeed, and my blood is drink indeed” (John 6:53-55). In fact, Jesus lost many followers when he refused to soften this teaching. The Catholic Church continues to teach that these words of Jesus are indeed to be taken literally. Through the laying on of hands in ordination in an unbroken apostolic succession, Catholic priests receive a special grace to be able to serve the faithful by acting in the person of Christ to make His body and blood truly present under the appearance of bread and wine. This consecration of the bread and wine takes place at the Mass. 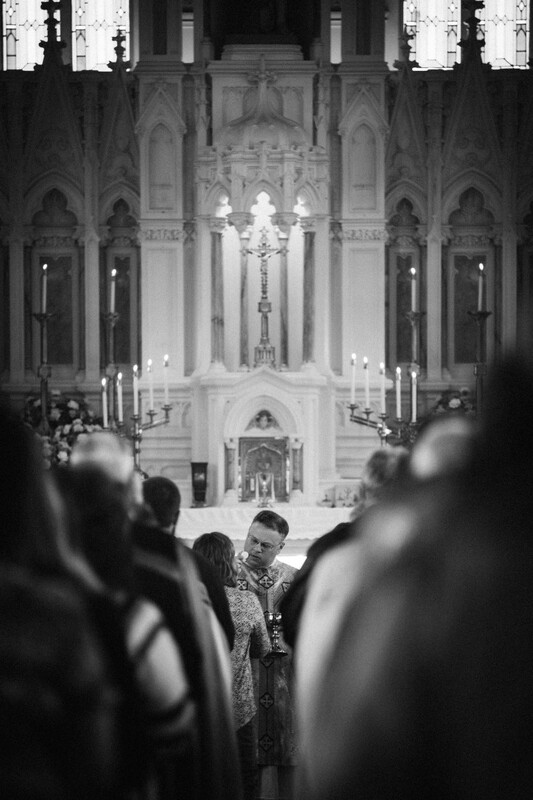 Because the Church teaches and believes that Jesus is truly present in Holy Communion, deep reverence for the Eucharist is shown by genuflecting when passing in front of the “tabernacle” (usually positioned behind the altar) where the consecrated host (“The Blessed Sacrament”) is reserved between Masses. 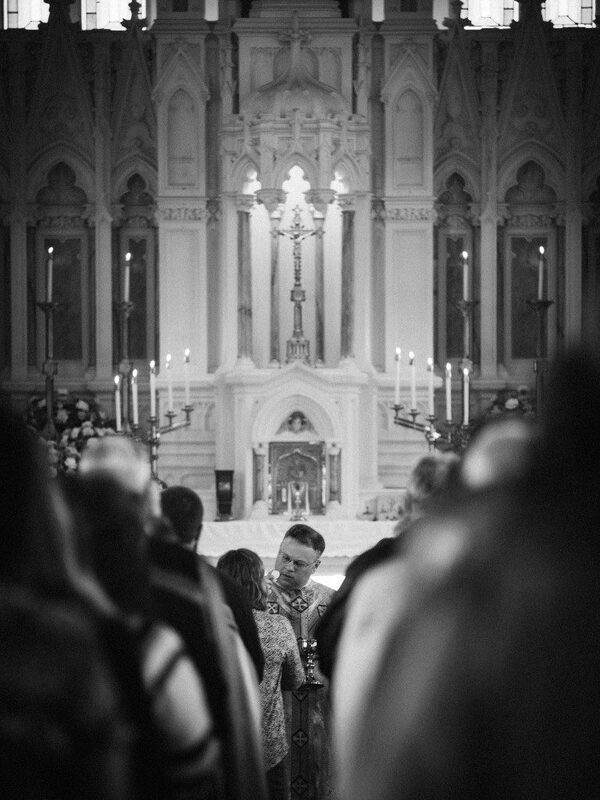 Because of deep reverence, Catholics also kneel in prayer both before and after receiving Holy Communion. The solitary, burning red light near the tabernacle signifies that the Blessed Sacrament is, indeed, inside. Analogously, the ancient Jewish tabernacle contained the “Holy of Holies,” the place where God dwelt for his chosen people. Therefore, it is not unusual to find Catholics kneeling in prayer before the tabernacle, or for Catholics to engage in “Eucharistic Adoration” (which is really adoration of God who is present in a special and unique way). 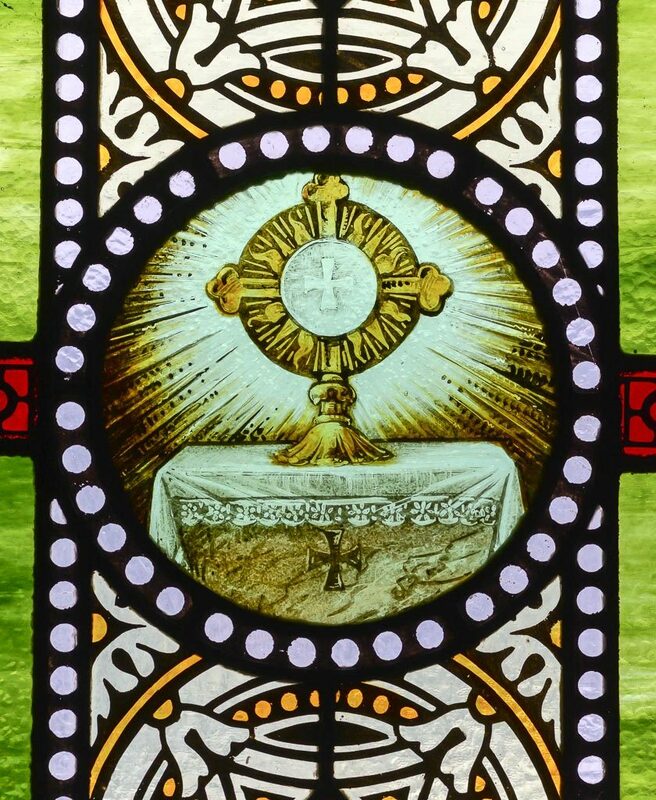 Catholics see the Eucharist as analogous to the “manna” that fed the Jewish people during the 40 years they wandered in the wilderness after their exodus from slavery in Egypt. Like manna, the Holy Eucharist unites us with Jesus and sustains us amidst the crosses of our own life journey. 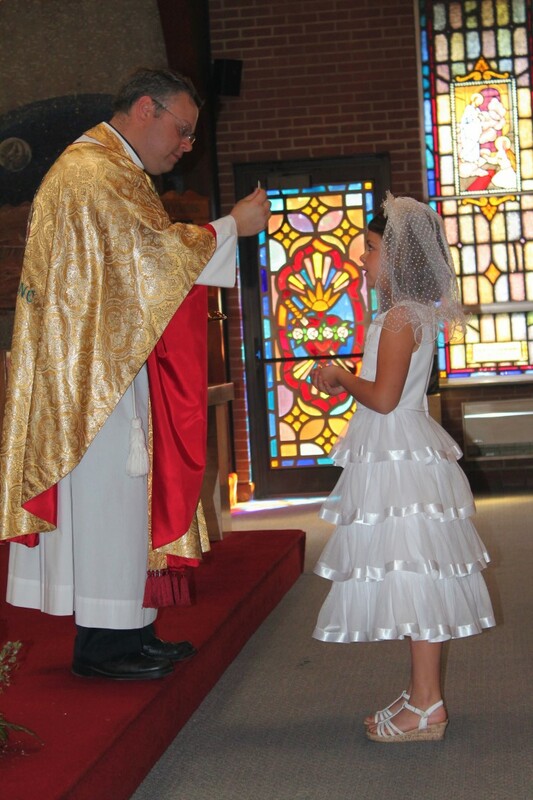 Receiving Holy Communion is reserved for practicing Catholics in a “state of grace” (meaning that they have repented of their sins and confessed any serious sins) and who have observed the required one-hour fast. Still, all are welcome to participate in the Mass and even go forward in the communion line. 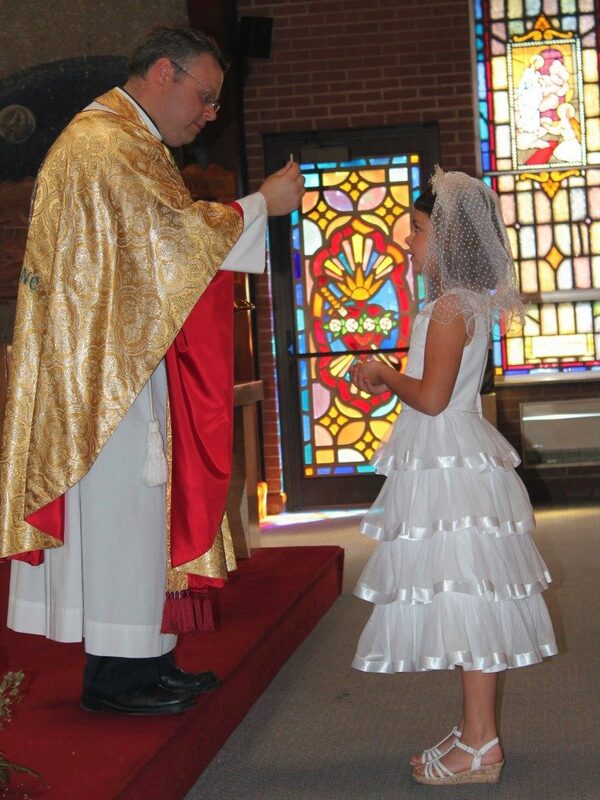 If you cannot receive Holy Communion, then please feel welcome to cross your arms in front of your chest when it is your turn and you will receive a blessing instead of Holy Communion. Click here for the regular mass times and here for additional mass times. 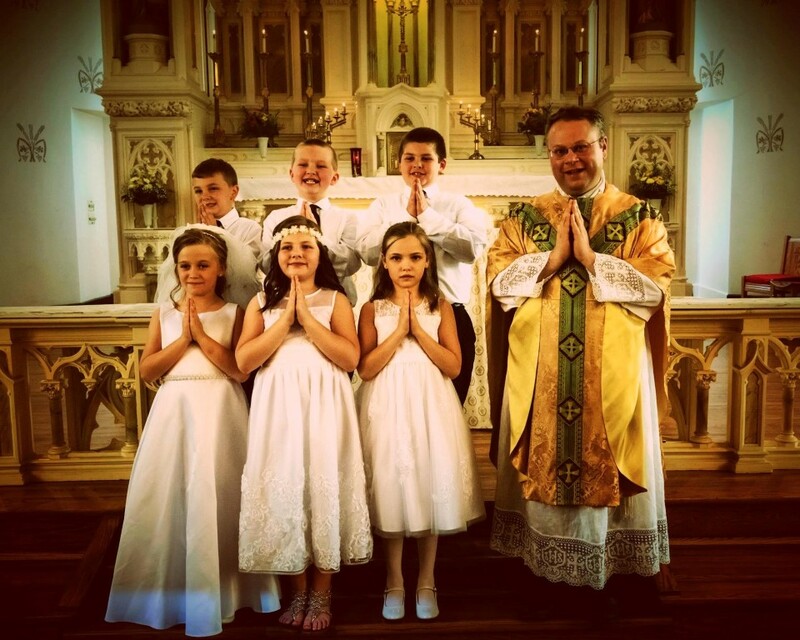 If you are homebound and wish to receive Holy Communion but are physically prevented from leaving your home, contact the parish office at 814-754-5224.